US district judge Haywood Gilliam last week rejected [PDF] AMD's claim that "a significant majority" of people understood the term "core" the same way it did as "not persuasive." What tech buyers imagine represents a core when it comes to processors would be a significant part of such a lawsuit, the judge noted, and so AMD's arguments were "premature." The so-called "eight core" chips contain four Bulldozer modules, the lawsuit notes, and these "sub-processors" each contain a pair of instruction-executing CPU cores. So, four modules times two CPU cores equals, in AMD's mind, eight CPU cores. And here's the sticking point: these two CPU cores, within a single Bulldozer module, share caches, frontend circuitry, and a single floating point unit (FPU). These shared resources cause bottlenecks that can slow the processor, it is claimed. 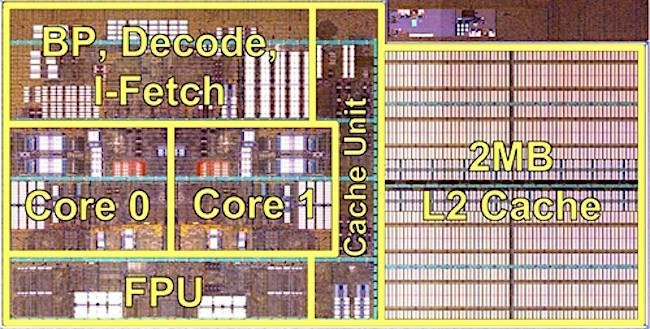 The plaintiffs, who sued back in 2015, argue that they bought a chip they thought would have eight independent processor cores – the advertising said it was the "first native 8-core desktop processor" – and paid a premium for that. They were misled, the lawsuit claims, in that they allegedly got eight partial cores, and so they want to be compensated for the difference in price between four and eight-core processors. There could be hundreds of thousands of people potentially impacted, and so any damages would stretch into millions of dollars. The chips impacted by the case are the FX-8120, FX-8150, FX-8320, FX8350, FX-8370, FX-9370, and FX-9590, specifically. AMD has its own language to describe its Bulldozer chips, which date back to 2011: it explained that the Bulldozer CPU cores are put into pairs, with each pair called a module. So an eight-core processor has four modules. Within each module, alongside the two x86 cores, is a single branch prediction engine, shared instruction fetch and decode circuitry, a single floating-point math unit, a single cache controller, a single 64KB L1 instruction cache, a single microcode memory area, and a single 2MB L2 cache. Individually, the cores have their own integer math unit, load-store engine, 16KB of L1 data cache, and other bits and pieces. This setup, AMD argues, is entirely consistent with what consumers understand as comprising a "core." AMD argues that some customers had also seen material that explained what its definition of a core is. But the court argued that legal precedent – a case involving frozen waffles, no less – that that was irrelevant to the question of whether a class action lawsuit should proceed. Waffles and chips sounds like a carb overload but the infamous case, Jones v Conagra foods, was also about labeling. The food combine argued that some of its products, labeled as “100% Natural” but containing oil from genetically modified organisms, weren't misleadingly branded. The court dealing with AMD's case will have to ascertain what consumers thought they were getting when they paid $300 apiece for their processors – roughly double the cost of four-core processors. As such, the judge approved the class action lawsuit and the two sides will be back in court on February 5 to decide the timeline of the case. AMD now faces a difficult decision; it can reach an agreement with the plaintiffs and take the financial hit but retain the ability to define the language around processors how it wants. Or it can go to a jury trial in which members of the public (albeit likely tech-savvy ones since the case is taking place in Silicon Valley) get to decide what legally defines the boundaries of a computer processor. "The class certification motion does not address the underlying merits of the plaintiffs’ claims, and we intend to defend ourselves vigorously," AMD told The Register in a statement. Of course, as we noted several years ago, AMD could undercut the lawsuit by proving that its eight-core Bulldozer processors doesn't drop to four-core performance in multi-threaded FPU benchmark tests.